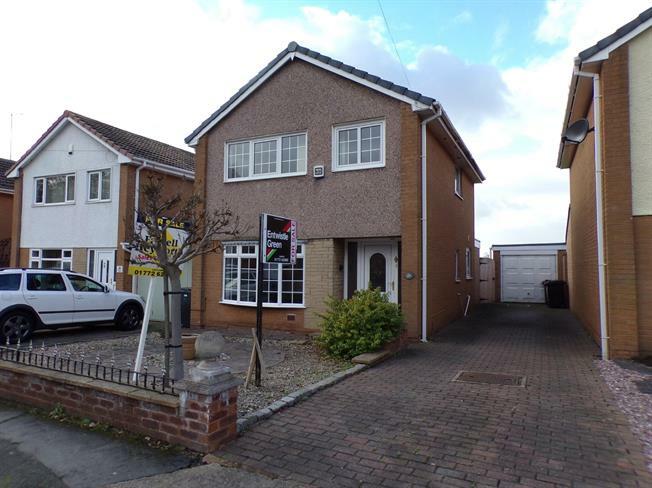 3 Bedroom Detached For Sale in Leyland for Offers Over £150,000. This property's price has dropped from £180,000 to Offers Over £150,000. FEATURED IN THE BIG OPEN HOUSE Sat 27th April 9am - 9.45am Call to book your slot! Extended three bedroom detached property with no chain, two reception rooms plus conservatory. This spacious property briefly comprises of; hallway, lounge, study open to dining room, conservatory, modern fitted kitchen leading to a utility room, three bedrooms and a modern fitted shower room to the first floor, to the outside; low maintenance gardens to front and rear, driveway leading to a detached single garage. The property benefits from gas central heating and double glazing. A viewing is highly recommended. UPVC double glazed front door, UPVC double glazed windows to front, stairs leading to first floor, under stair storage, radiator, tiled flooring. UPVC double glazed window to side, low flush WC, wash hand basin, tiled walls, tiled flooring. UPVC double glazed bow window to front, radiator, laminate flooring, gas fire with feature surround, three wall light points. A range of fitted furniture including wall and base units, laminate flooring, open to dining room. UPVC double glazed door leading to conservatory, UPVC double glazed windows to rear, laminate flooring, radiator. UPVC double glazed windows to three sides, UPVC double glazed single door leading out to the rear garden, tiled flooring, tiled walls. UPVC double glazed window to side, wall and base units with complementary worktop, one and a half bowl sink with mixer tap, integrated five ring gas hob with overhead extractor, integrated fridge, integrated electric double oven, part tiled walls, down lights to ceiling, open to utility. UPVC double glazed window to rear, wall and base units with complementary worktop, space for washing machine, integrated freezer, tiled splash backs, UPVC double glazed door leading out to the side access. UPVC double glazed window to side, loft access, storage cupboard. UPVC double glazed window to front, fitted wardrobes and bedside cabinets, radiator, laminate flooring, on wall light point, storage cupboard. UPVC double glazed window to rear, radiator, laminate flooring, fitted wardrobes, dressing table and overhead storage, storage cupboard. UPVC double glazed window to front, radiator, fitted wall units, cylinder cupboard. UPVC double glazed window to rear, low flush WC, wash hand basin, corner enclosed shower cubicle, fitted modern base units, fully tiled walls, chrome heated towel rail, shaving point. To the front is a low maintenance garden with a block paved driveway providing ample parking leading to a single detached garage. The garage has an up and over door, power and light. Gated access leads to an enclosed rear garden which is mainly cobbled with a raised border.